All Ojai homes currently listed for sale in Ojai as of 04/20/2019 are shown below. You can change the search criteria at any time by pressing the 'Change Search' button below. If you have any questions or you would like more information about any Ojai homes for sale or other Ojai real estate, please contact us and one of our knowledgeable Ojai REALTORS® would be pleased to assist you. "First time to market! Thacher Road's Pierpont Cottages - 5.05 Acres, which includes nine rentals (eight houses), Julia Morgan Craftsman residence - 1.3 acres(Architect to Hearst Castle, Fairmont Hotel San Francisco & more), and 25.02 prime Acres! Nestled in a oak-strewn setting, the stone and wood residence was built of native stone and seems an integral part of the natural surroundings." "One of the most magnificent estates in Ojai's desirable East End, a private retreat on 40 acres with sweeping valley, mountain and celestial views, is minutes from town. This exceptional property offers an artisanal Tuscan villa on a single level with gracious indoor-outdoor living and spectacular views from every room. Surrounded by vineyards, olive groves, a mandala lavender farm, a shaded dry garden, a terraced orchard and acres of natural beauty and hiking trails. With active solar hot water, a solar heated infinity pool & spa, a custom wine cellar, 3 fireplaces, 16 FT ceilings, an infrared sauna, pet fencing and an EV charging station. An abundant well and a private water system supplies the entire property. Guest house level site with site plan, tests and reports." "Secluded in groves of olive and citrus in the heart of the Ojai Valley, this strikingItalian villa is a beautiful escape. Surrounded by mountains and a view of the famousOjai 'pink moment', the 12.6-acre Omaggio estate is grower and producer of thefirst US extra virgin olive oil to win the LA County Fair international olive oilcompetition. Features a picturesque Mulberry tree-canopied drive; mature shade,palm and Cyprus trees; lavender and rosemary; formal gardens, fountains and pool.Inside, soaring ceilings and abundant natural light. Interior includes formal diningroom, library, 3 fireplaces, 7 bedrooms, 7 1/2 baths, bonus/flex room, and large livingand family rooms with French doors opening to front and rear patios and gardens.In addition: 3-car garage, Tesla charger, and hot tub; naval and Valencia oranges,grapefruit, guava, apple, fig, and walnut trees. Over 2,200 mature imported olivetrees for making of the finest extra virgin olive oils; a modern working olive mill;and tasting room/rental unit." "Welcome to Twenty-Three Palms! This elegant custom villa in one of Ojai's most desirable east end locations, set on over 2 private acres with stunning mountain views. The main house is finished to the finest detail, with two generous bedrooms, each with an en-suite bathroom and French doors opening onto beautiful patios. Living in this spectacular architectural expression with hewn wood floors, natural stone and exquisite light, one could easily imagine being at one of the Aman resorts. The Brazilian quartzite kitchen counters highlight the expansive, modern gourmet kitchen featuring a handsome Lacanche stove. A covered veranda off the living room invites you to relax by the glimmering infinity pool; the ultimate in California indoor-outdoor living. The Brazilian quartzite kitchen counters highlight the expansive, modern gourmet kitchen featuring a handsome Lacanche stove. A covered veranda off the living room invites you to relax by the glimmering infinity pool; the ultimate in California indoor-outdoor living. A private, 2 bedroom guest cottage with a full kitchen, fireplace and marble bathroom offer friends and family a chic retreat. The luxurious artist's studio, with soaring ceilings and a full bathroom, can also double as guest quarters." "Close to Los Angeles but a world away, GEMSTONE RANCH in OJAI is the ideal escape. With it's 10+/- bucolic acres, GEMSTONE meets all of your relaxation and recreation desires - horses, tennis, swimming, basketball, farming or, the ultimate luxury, simply doing nothing. With a 7500+ square foot luxurious MAIN LODGE and 1200+ square foot POOL/GUEST HOUSE, GEMSTONE offers every amenity of home, with a coveted single-story floor plan that invites multi-generational opportunities to gather family and friends. For the horse enthusiast - a LIGHTED RIDING ARENA, 5 acre hay pasture and, STABLES and breezeways. For the sports enthusiast - a LIGHTED NORTH/SOUTH CHAMPIONSHIP TENNIS COURT that does double duty with an all-weather surface and FULL COURT BASKETBALL equipment. For the gardener - ORCHARDS and gardens fed by your own well with almost 100 walnut trees and dozens of varieties of other fruit trees. And for those who want to enjoy it all with family and friends - a gorgeous freeform pool and water slide, sauna and outdoor dining complete with wood-fire pizza oven from where you can sit back and enjoy Ojai's famous Pink Moment across the Topatopa's. And, when you're not using it yourself, GEMSTONE has a proven INCOME stream as a VACATION RENTAL. Whether it's your main home or your vacation home, GEMSTONE can be your oasis." 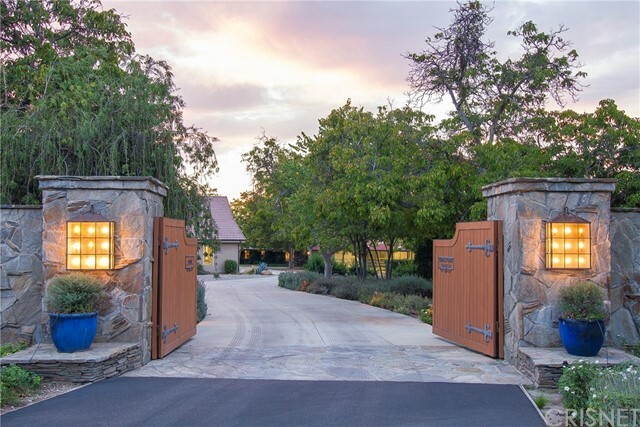 "This awe-inspiring Upper Ojai estate is located in a gated private enclave off Ojai Road, offering an ideal sanctuary for both a weekend getaway or full time residence. Nestled on 10.58 acres,, this legacy property offers refined, yet informal country living and boasts head-on, unparalleled views of the Topatopa Mountain range. No detail was overlooked in the impeccable renovation of the Hacienda-style house, which has been transformed into an organic, yet contemporary jewel offering 4 BR's, 2 and 1/2 baths, mountain views from most rooms, a separate studio w/ bath & a host of exceptional amenities. A combination of natural & manicured landscaping envelopes the home. Oak groves, seasonal creek, native plantings, fruit trees, rolling hills, stone walls & steps, & an olive tree-lined entry beautify the pristine environs. A stunning 65-foot lap pool with spa overlooks the rolling acreage and valley. The ultimate in Upper Ojai lifestyle. Furnishings available for additional consideration." "Classic Contemporary, designed by State Appointed Architect - Fred Hummel. Gated Drive climbs to a private hilltop - offering incredible views. Totaling 11.67 acres, this estate is comprised of two legal parcels - 5.9 acres with the residence, and 5.77 acres. The Architectural home was designed to flow inside and out, capturing all of the tremendous views. Sellers just completed a new heating and air-conditioning system, resurfaced the tennis court in 2013, new insulation in 2015. This Mid-Century home is well maintained and shows pride of ownership." "This timelessly lovely, Spanish-style estate, is perfectly sited on 110+/- acres to capture the most beautiful views in Ojai! The Main House is graced by a jaw-dropping Entry and Great Room with open-beam, soaring ceilings, cherry-wood floors and never-ending windows. The Kitchen has tons of rustic alder cabinets, full-size Sub-Zero Fridge and Freezer, a Dacor double oven and 6-burner range. The spacious Master Bedroom and Bath exist in their own wing with French doors to the outdoor space, a jetted tub and steam shower, while the two other bedrooms and a full bath are in a separate wing. In the same beautiful style is a 4 bed, 2 bath Guest House and a 1000sqft Art Studio awaiting your muse. The grounds offer nearly 200 oil-producing olive trees and 20 fruit trees including plum, nectarine and apricot and a charming, screened gazebo for outdoor dining. Serviced by a great well and powered by solar this Ojai compound is the ultimate retreat!" "20+ Acre Ranch, located behind electronic gates, this equestrian facility includes a 10-stall metal barn, large steel ag or shop building, six paddocks, large riding (roping), cutting arena, training pen, hot-walker - and surrounded by trees. Water is provided by a well and Casitas Water Co. This beautiful Mediterranean homes includes a guest/pool house (1,220 Sq. Ft.), a pond pool and waterfall spa." "Beautiful equestrian estate in Ojai's picturesque valley, located 4.7 miles from Downtown Ojai, is available to be your personal rejuvenating retreat. Towering oaks shade the secluded ranch/lodge-style home. Designed by local and award-winning Whitman Architectural Design, this home boasts vaulted wood beamed ceilings, rock feature accents and a grand fireplace. The 5,000 square feet split level design provides: five bedrooms, five bathrooms, formal and casual dining, game room, media room, spacious master suite, and much more. Step outside to your outdoor entertaining space which includes a swimming pool and spa surrounded by river rock patios and a built-in grill. In addition to the beautiful home, situated on the approximate 13 acre property, is an operational and income generating equestrian center. Facilities include: main barn with sixty 12x12 indoor stalls, twenty 12X24 covered paddocks, 4 indoor wash racks, 2 tack rooms, 320'X120' show arena, training arena, round pen, hot walkers, and an office." "This home's modern farmhouse architecture designed by Tim Wallace brings to mind the rustic vineyard estates of Napa Valley. Surrounded by its own hay fields, sweeping views of the TopaTopa Mountain range, Chief's Peak, Sulphur Mountain and Santa Paula Peak, you'll feel you're in a world all your own. When you enter the great room, the stunning 16-ft. high wood ceilings and walls of windows and retractable glass doors usher the outdoors in. The kitchen features rustic reclaimed wood bar above gemstone granite countertops.Stained concrete floors downstairs and bamboo upstairs. Media room with screen and projector.Spacious bedrooms w/view balconies.Solar power (owned). Lap pool. 2020 sq.ft.barn. WELL and Casitas water meter. EV charging in triple garage." "Tucked away behind a gated entry, this Upper Ojai ranch is just waiting for you to customize its many offerings to create your perfect weekend getaway, corporate retreat, screenwriters' workshop, or semi-rural recording studio. The main house offers three bedrooms, a formal dining room, office, mud room, farmhouse kitchen with island and breakfast nook, and separate, one-bedroom, one-bath guest quarters. Beyond the large parking area, your guests can enjoy a multi-purpose sports court, shuffleboard, horseshoe pit, multiple outdoor living areas, and plenty of spots where they can enjoy the amazing views. Just a short walk from the main house, there is an Old West-style saloon, a two-room rec building with a kitchen and bathroom, and a large pond with a rock island, sun deck and waterfalls. Paradise Ranch also features a caretaker's house, equipment barn with large workshop, a second workshop or storage shed, seasonal creek, and plenty of usable land for ag or hobbies." "Welcome to this picturesque Craftsman home, situated on one of the Arbolada's most coveted lots. Formal entry invites you into the living room w/ built-in bookcases, skylight & masonry fireplace. Kitchen is flowing w/ light & features hardwood floors, center island & country sink. Breakfast room that opens to the backyard w/ trickling sounds of a stone fountain. Master suite w/ multiple closets, dual vanity, private sitting/exercise area & iron balcony overlooking the backyard & majestic scenery. Master bath accented by tile showers & views of the backyard. Windows throughout the house provide for natural light that filters in during the day. The screened porch is perfect for warm evenings & was designed to accommodate two pairs of hand hammered Art Deco gates. Mature oak trees w/ drought tolerant plants, herbs & raised vegetable beds. Outdoor sitting areas throughout, w/ Koi pond, surrounded by meandering DG paths. Indoor/outdoor living at its finest, within walking distance to town." "Magnificent Mediterranean Estate in a desirable and private location within the gated community of Rancho Matilija. This property blends remarkable architecture and superior craftsmanship to create sun-filled living spaces that open to verandas on over 2 acres of pristinely landscaped grounds. As you walk through the Italian-esque portico you pass through a gracious foyer and living room with vaulted, open beam ceilings, surrounded by a formal dining room, family room, gourmet kitchen with breakfast room, media room, games room with bar and library, as well as an office and guest suite with private entrance. The second floor features a wing with three ensuite bedrooms, all with terraces. The dreamy master escape features a sitting area, fireplace, walk-in closet and a luxurious spa bath with separate shower. The grounds also boast a custom pool, fruit trees, a courtyard and 6-car garage. Enjoy pink moment sunsets & Topa Topa mountain views while living a vacation lifestyle year round." "Dreaming of owning a ranch in Ojai's East End? Look no further! Rare opportunity to have a sprawling citrus ranch with 15+ flat usable acres. The 3 bedroom, 2 bathroom ranch house has an upgraded kitchen, master bath and a large living room addition. Nice outdoor living space with covered patio, BBO and fire pit area, a play house for the kids and ample room for a pool. Lovely mountain and Topa Topa views surround this special property. Current income from citrus trees, guest house, and equestrian area lease. Property has both a private well and Casitas water." "Entertainer's Dream! Beautiful architectural estate situated on private 6+ acres with stunning views of surrounding mountains. California native Oaks line the meandering driveway Leading to this private estate. The designer built home for his family with quality throughout. Concrete tile roof, Stone and stucco siding. Interior with extra high vaulted ceilings and open floor plan. 3 custom fireplaces, Great room, sunken living, Spacious kitchen has double ovens, island with produce sink and breakfast bar, desk, wine fridge, grilling station and walk-in pantry. Plus sunken wet bar, separate formal and casual dining, and office. 5 bedrooms all with a en suite bathroom. The master suite features a jetted tub, dual-sink vanity, walk-in closet, private balcony. The outdoors include Baja pool/spa, outdoor kitchen, bathroom, large patio with a pergola. Owned solar panels, horse area, Green house and gardens. Separate 2-bedroom 2nd home, kitchen, RV parking and separate garage. Minutes from City of Ojai, Trails and the Ojai Valley inn and spa. Priced reduced for a Best Buy in Ojai Valley"
"Escape from the ordinary! Tucked away on an impressive 5 acre parcel and bordering the Ojai Valley Land Conservancy sits this incredible private estate. A delightful stone cottage and a 3000 sqft. studio/art/work space. Surrounded by mountain views, hiking & biking trails, swimming holes and open space. A multitude of entertaining areas equipped with decks, palapas, tee pees, fire pits and amazing spots for sleeping under the stars. There is also a well that feeds the properties mature landscape, fruit trees, and magnificent palms. Ideal opportunity for a family retreat with ample areas for a pool, tennis courts or horse arena. The possibilities are endless with this property that offers 360 degree, uninterrupted view of the natural world." "The lovely Bella Vista estate brings you all of the enchantment of Ojai. This gated, very private property consists of two homes-a 4BR/3BA main house and 2BR/1BA guest house, surrounded by a fragrant orange grove, rose, sage, lavender gardens, raised vegetable beds, a swimming pool, natural rock walls, and beautiful views. You will feel at peace in this light-filled home including classic Craftsman-style architecture, quality features like reclaimed hardwood floors and window/door casings, wood-burning stone fireplaces, and a gourmet cook's kitchen with Viking range and Sub-Zero fridge. Four spacious bedrooms invite you to relax and renew. The three baths feature artistic tile work designed by the famous RTK Studios. The romantic upstairs master suite includes stained-glass windows, its own fireplace, a balcony overlooking the pool, and magical sunset views. Follow the meandering footpath to the historic 2-bedroom guest house with full kitchen and cozy vintage charm." "Tucked away with forest like grounds on a Cul de Sac in tranquil Rancho Matilija with gorgeous mountain views you will discover one of the newer, high quality constructed custom homes built by the current seller. High ceilings and impeccable Brazilian mahogany engineered floors greet you with a sense of openness as you enter this beautiful home featuring four spacious bedrooms, five and a half baths and an office on just over two acres. One can notice the Greene and Greene influence in the design of the African mahogany stairs. Adorned with three eloquent fireplaces, open beams, rounded walls, butler's pantry and solid walnut cabinets throughout the kitchen with upgraded appliances, granite countertops and inlaid speakers strategically placed for your listening pleasure. There is a spacious 3 car finished garage plus a workshop area offers space for your cars and creations. This is truly a lovely home!" "A beautiful Crafstman-style home in the heart of Ojai's prestigious East End. With two large bedrooms on opposite wings of the home, both with en-suite bathrooms, this open floor-plan includes a great room with vaulted and beamed ceilings and a massive rock fireplace, and an open kitchen with custom mahogany cabinets. Sitting on one acre with picture perfect views of the Topa Topa Mountains, the grounds offer many areas to relax and entertain with an outdoor cooking and dining area, beautiful rock walls, and a three-car detached garage. Enjoy your own fresh oranges from the many citrus trees around the property, and marvel at one of the most majestic Oaks in the Ojai Valley, all just minutes to downtown Ojai and all the local shops and restaurants." "Find yourself drawn to the quiet and serenity of this unique property tucked away on one of the most private, prestigious lanes in Ojai. Located just steps away from the world class Ojai Valley Inn. This home offers 5 bedrooms & 4 bathrooms w/seamless indoor/outdoor living. The master bedroom will become your sanctuary with its fireplace, spa-like bathroom & private balcony, overlooking your 150yr old majestic oaks. The library offers you views of the Topa Topa's where you can enjoy the famous 'Pink Moment.' The kitchen provides a joyful gathering space & can accommodate large groups of people for all your entertaining needs. This private getaway also has a permitted horse barn that can be utilized as an art or yoga studio, or any of your custom needs. Solar panels serve to greatly offset the cost of electricity while several citrus & other fruit trees adorn the property bearing delicious fruit throughout the year. Fine dining, hiking & horse back riding trails, walking/bike path to downtown Ojai, world class golf & Spa, plus spectacular scenery await you. Has operated as a profitable retreat center." 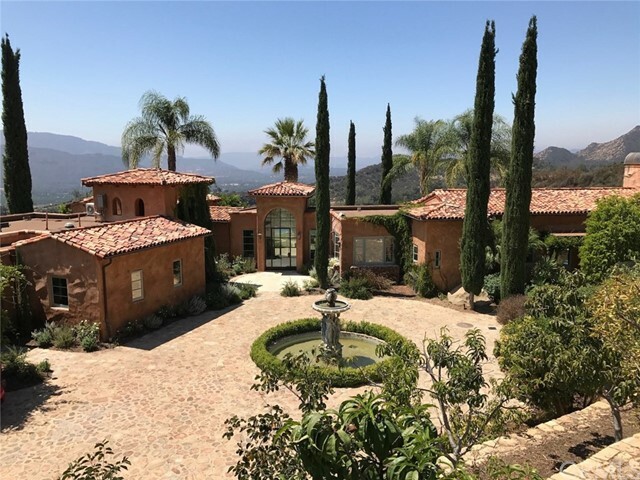 "Remodeled stunning Spanish style 3,000 + sq ft. home with several upgrades sits on one acre touting panoramic views of the Topa Topa Mountains, and is located in the very desirable Del Oro community. 3 spacious bedrooms and 3 baths, an impressive master suite with sitting area and large walk-in closet. Chef's kitchen with a breakfast bar and custom cabinets, Brazilian hardwood floors, quartzite counters, upgraded doors and windows as well as a flagstone patio are just a few of the enhancements. The very large patio style balcony offers sweeping mountain views. Pick some fruit from the family orchard, relax in the soaking tub or enjoy the very unique, double-sided brick fireplace which is sure to attract your attention. Featuring drought tolerant landscaping, outdoor seating areas, garden beds that are fully piped for irrigation and a large courtyard fountain as well as room for a pool. This beautiful property should be on your must see list!" "Pure Ojai~ within minutes to downtown while feeling miles away! Located in the desirable Arbolada neighborhood, this charming property offers an authentic Ojai compound (multiple structures) on just over an acre of land. The Craftsman style main house features an open living area with an abundance of natural light, large windows with views of the backyard, stone fireplace, hardwood floors and vaulted ceilings. Enjoy the gourmet kitchen and the large formal dining room with direct access to the inviting backyard, the perfect place to garden & entertain! As you stroll through the grounds you will find two additional structures ~ a private guest house with its own attached garage and large yard & a darling art studio, set amongst an abundance of fruit trees. The property is complete with a detached 2 car garage solar panels, a variety of vegetable beds, and large patios throughout. Embodying the Ojai lifestyle and serenity at its best!" "This is the Ojai estate you've dreamed about. Close to town and the Ojai Valley Inn and Spa, yet private and peaceful on a hilltop of your own. You'll love the WOW factor when you enter through the front door when a cozy sitting room with fireplace opens up to a grand great room with vaulted beamed ceilings, fireplace, a gourmet kitchen with SubZero, Wolfe stove and hood, microwave, farm sink, honed marble countertops on a 9-ft. island. Generous use of glass reveals a view of the Ojai Valley Inn and Spa, the Topa Topas and our famous Pink Moment! Stunning Master Suite with office/sitting room and super luxe marble bath with free=standing tub and oversized shower opens to fabulous new pool, deck with fireplace and pool house with bath and sauna. The guest house is a modern dream with vaulted beamed ceilings, a great kitchen and bath. There's also a separate garage. 1/2 acre buildable parcel available. This is the ultimate turnkey opportunity. Don't let it pass you by!"